Today’s Sundance doc profiles wrap up with: CITY OF GOLD, Laura Gabbert’s portrait of a gourmand and the city he loves. Bombing through colorful neighborhoods in his green pickup truck, Gold is sniffing out his next strip-mall discovery—whether Oaxacan grasshopper soup, hand-cut tonkotsu ramen, or a particularly unctuous pad see ew. As piping-hot platters are served up, so are stories of immigrants whose secret family recipes are like sacred offerings pledged for the opportunity to build their American Dream. With eternal curiosity, razor-sharp intellect, and existential longing, Gold is a culinary geographer taking us where no critic has gone before. Like the film, Gold makes low culture high and high culture relevant, teasing out the meaning of life from a Korean taco, and pondering all that makes us different and all that makes us exactly the same. Laura Gabbert’s previous Sundance credits include producing and directing NO IMPACT MAN (2009) and producing GETTING TO KNOW YOU (1999). Fellow producer Holly Becker executive produced the Sundance fiction films ME AND YOU AND EVERYONE WE KNOW (2005) and CAMP (2003) for IFC Entertainment, and most recently produced THE SOURCE FAMILY, which debuted at SXSW. Executive producers are Braxton Pope, who produced the Sundance narrative SHRINK (2009) as well as the controversial Paul Schrader film THE CANYONS, and longtime Gold friend, investor Jamie Wolf. The project’s editors are William Haugse, whose Sundance credits include fellow 2015 title IN FOOTBALL WE TRUST, HOOP DREAMS (1994, 2014), STEVIE (2003), and NO IMPACT MAN, and Greg King. 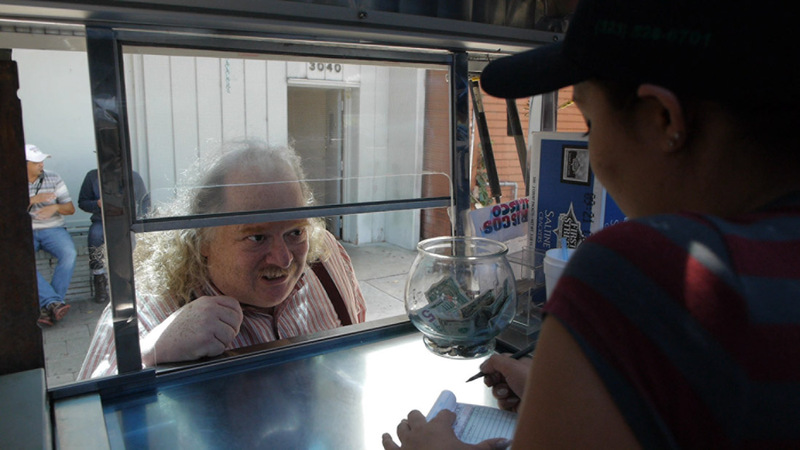 Simultaneously a film that celebrates food culture and a city that often is too easily dismissed as a plastic, homogenous, one industry town, Gabbert’s profile reveals an unexpectedly diverse, rich foundation to Los Angeles through Gold’s infectious spirit of discovery and his carefully composed writing. For more information, check out the film’s Facebook page. For Gabbert’s thoughts on the film, watch her Sundance Meet the Artists profile and check out her Indiewire filmmaker interview. For screening dates and times at Sundance, click the link in the first paragraph.